One of the most effective ways to reduce the cost of fitting out a new industrial unit or factory is to consider used material handling equipment in addition to new stock. This will allow you to make cut backs on your acquisition costs in a number of different areas, and lower the cost to your business of having the best possible production and dispatch processes. While certain used items should not be considered, due to higher maintenance costs, static items such as pallet racks offer an excellent solution. At Easy Rack, you can find a wide range of used material handling equipment that can be installed easily and thanks to the variety of different components and items available from stock, you can be confident that we can provide you with the exact same levels of quality and convenience that you would expect from brand new gear at a fraction of the cost you would have to pay otherwise. We offer a comprehensive range of used pallet racks that can be installed by a team very quickly, and delivered anywhere in the continental <?xml:namespace prefix = st1 ns = "urn:schemas-microsoft-com:office:smarttags" />USA within a couple of days of placing your order. Thanks to our extensive stock of all different specifications of equipment, you can build a bespoke system of racks and shelving that will completely meet your needs and provide you with a workplace that meets your exact storage requirements at a very attractive price. From used tear drop pallet racks that offer easy access for forklifts and can be used in any environment through to very specific racks to hold used tires and much more, at Easy Rack, you will be able to find the exact used material handling equipment that you need to ensure that you are able to create a workplace that always runs at maximum efficiency. Perhaps the most important considerations when purchasing shelving, whether brand new or used is the amount of storage space it supplies, and the ease with which goods can be loaded into place and accessed later. Easy Rack offers very large variety of wide span industrial and commercial steel shelving as part of their impressive range of used material handling equipment. By allowing for more space between the supports, you can have more pallets in place and get easier access to the ones that you are storing for your forklift. The greater strength of the shelves is created by heavy duty reinforcement being built into the shelf. 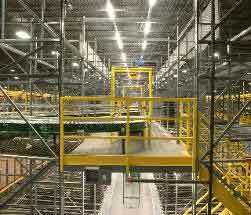 Cantilever Racks are one of the most useful storage systems that you can possibly install in your workplace. Once mounted onto a wall or other vertical support, you will be able to use them for a wide variety of tasks such as storing pipes, lengths of metal, or even as support for long span shelving that can store almost any goods safely and conveniently for as soon as it is required. Choosing used material handling equipment, especially in the form of shelving is a great way of reducing the acquisition costs for your business, and provided that you source equipment from a reputable supplier such as Easy Rack, buying used does not mean that you have to make any compromises on the quality or reliability on your purchase. As you continue to read through our selection of Used Material Handling Equipment, keep in mind we stand ready to answer any questions you may have about our offerings. Call us at 1-888-776-3720 whenever such questions arise and let us help you make the best investment within your budget. We are located in Houston, Texas.